Half moons. This one was a tricky day for me. I had a bunch of ideas for this but none of them really panned out when I started trying to execute, and then I was basically left with nothing. I was able to come up with a few smidges of ideas, but nothing that really called to me. I eventually came up with this stripe design while messing around with the stickers a bit. 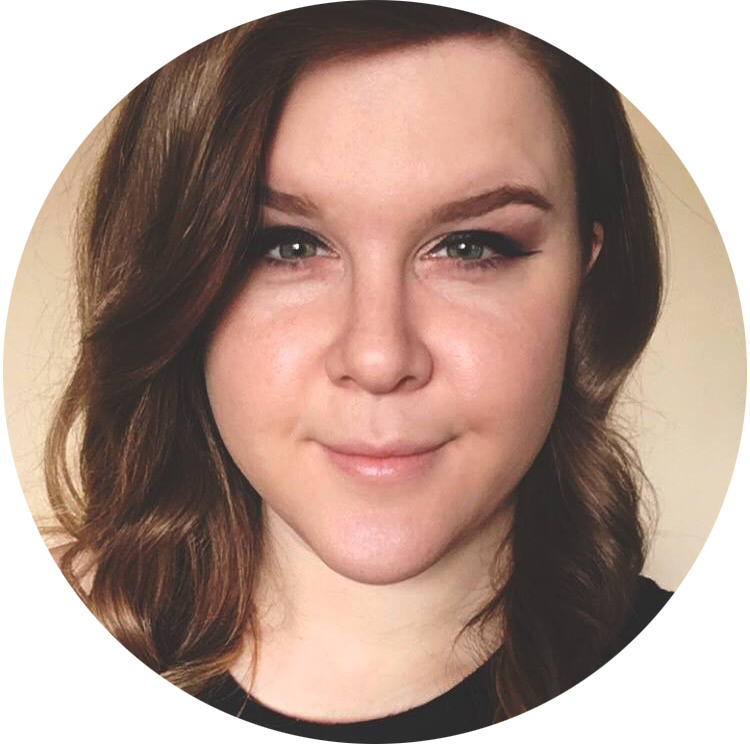 If you've never done half moons before, you can find some helpful hints in last year's half moon post! 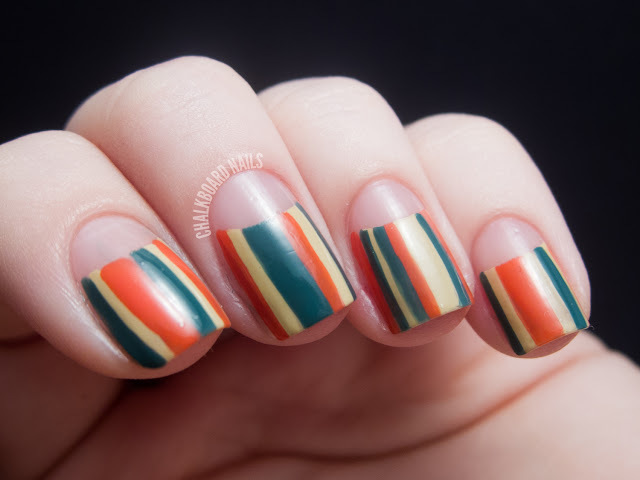 So after applying the hole punch reinforcement stickers, I just freehanded on some stripes using my medium length striper. I removed the sticker and then these were left! The colors here are China Glaze Exotic Encounters, China Glaze Kalahari Kiss, and China Glaze High Hopes. All alliterative colors! COOL! Make sure to check out the upcoming 31 Day Challenge prompts here! 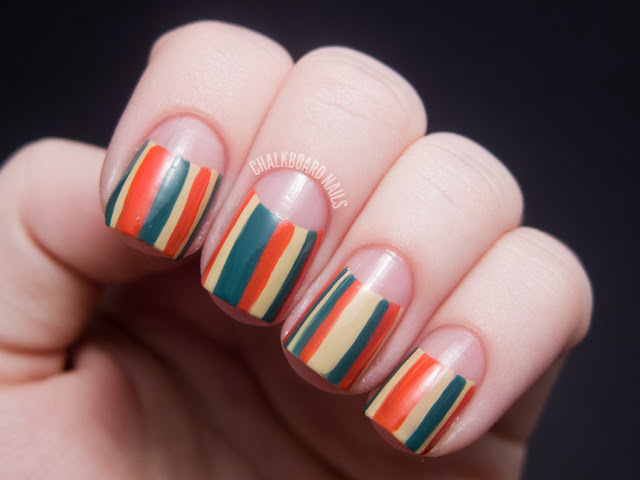 Oh I am so feeling the stripes! Pretty! LOVE this! I love Kalahari Kiss...it's so retro! beautiful! love the colour combination. 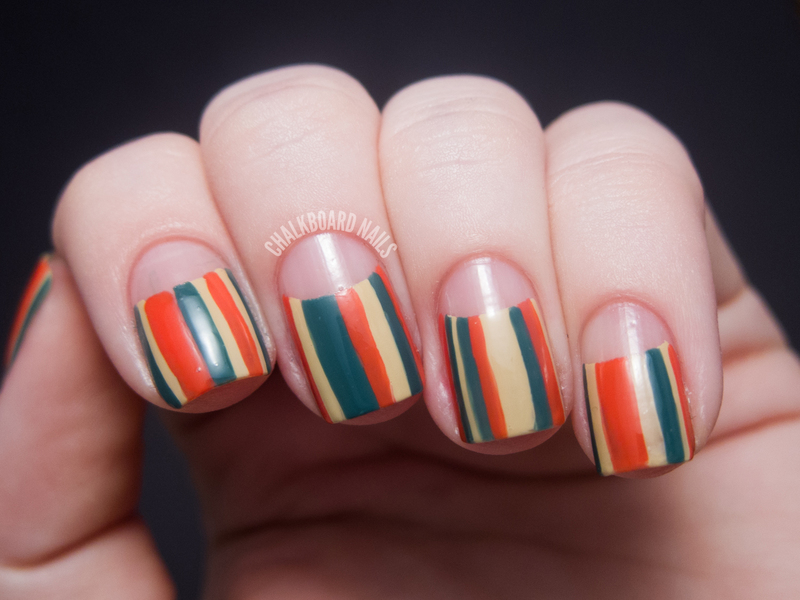 and loving the little variations of the stripes! Love the Dad pants reference. Pretty sure that Dad was mine ;) And the mani is wonderful! Question, how do you do your thumb nail? Whenever I do it using the paper reinforcers it is never a big enough arc. I try to do it freehand, but it never looks neat enough. I'm able to get away with using the reinforcements on my thumb too. Maybe if you cut one side of the circle you would be able to spread it open just enough to use it? I had this problem, too, until I noticed that they sell different sizes. I believe I bought 1/4 when I should have bought 3/4 inch. 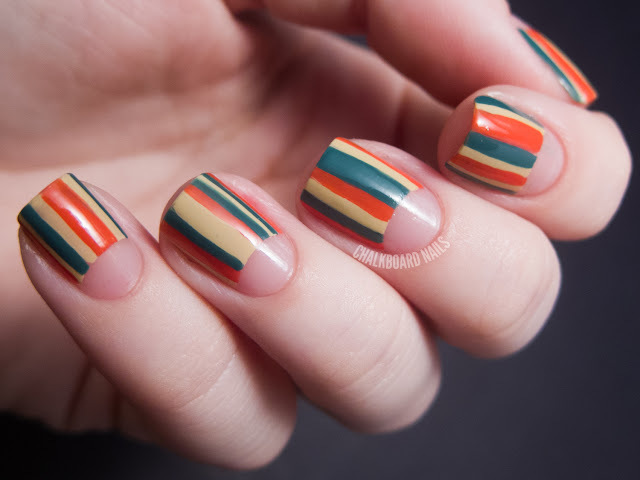 I love this nail art and yes the colors definitely made me think retro! Thanks for sharing! This is really cute! I love these three colors together! Oh that's just stunning! 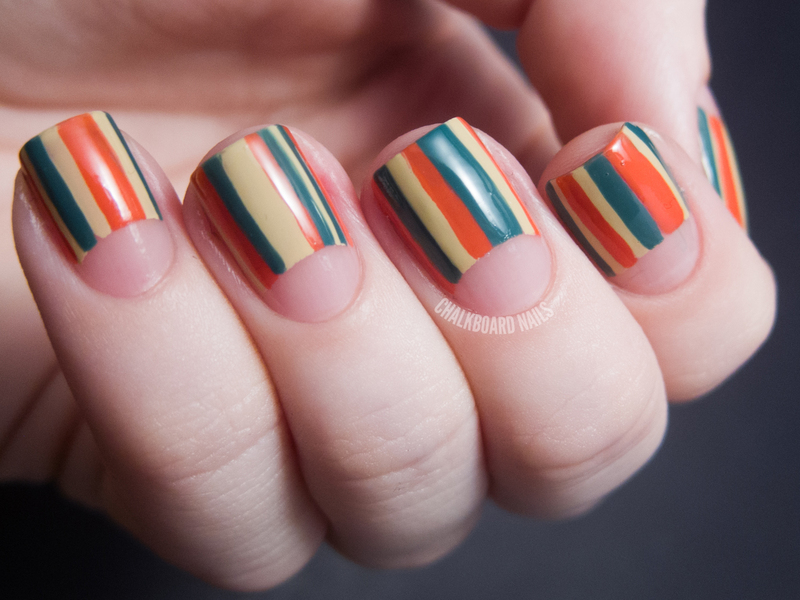 I do love stripy nails, and those are gorgeous. I love how you're reimagining these challenges.